In “The Great Quake,” Henry Fountain recounts the story of the 1964 Alaska Earthquake, and how it advanced our understanding of earthquake science. 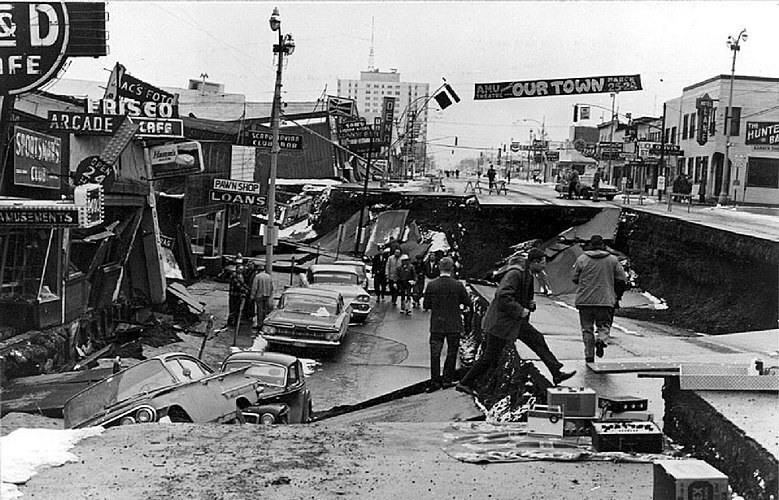 Damage to Fourth Ave. in Anchorage, caused by the Great Alaska Earthquake of 1964. Public domain. On March 27, 1964—Good Friday—the most powerful earthquake in the history of North America struck the state of Alaska, with Whittier, Prince William Sound and Valdez forming a half-circle to the west, south and east of the epicenter. In Anchorage, seventy-five miles to the northwest, half of a downtown street (Fourth Avenue) dropped ten feet, which explains why the above U.S. Geological Survey photo is commonly used to illustrate the extent of the damage. To this day, the so-called Great Alaska Earthquake of 1964 (magnitude 9.2) remains the second most powerful in world history. Oddly, it is not particularly well remembered outside Alaska, as the death toll was modest for an earthquake of its size. On the other hand, it was a watershed event for earthquake science, as subsequent research into the mechanics of the quake helped confirm the theory of plate tectonics. In the new book “The Great Quake: How the Biggest Earthquake in North America Changed Our Understanding of the Planet” (Crown), New York Times reporter Henry Fountain recounts the story of the 1964 Alaska Earthquake, and highlights the work of geologist George Plafker, who had no seismology training, yet managed to discern how this megathrust earthquake unfolded. In the following Failure Interview, Fountain vividly describes the power of the Good Friday earthquake, reveals where damage to the land is still visible today, and how Plafker figured out what occurred. The Alaska earthquake of 1964 still ranks as the second most powerful in history. Can you paint a picture of what it was like for those who lived through it? Well, the biggest thing about it to my way of thinking has to be how strong it was and how long it lasted. With most earthquakes the shaking lasts for a few seconds or maybe half a minute or a minute. With this earthquake the ground shook for something like four-and-a-half minutes. That’s a really long time, and obviously the power of it was such that people saw things they’d never seen before, with the ground rippling in large waves, like the ocean. Or trees swaying so much that the tops of the trees actually slapped the ground as they shook back and forth. Not to mention incredible landslides and avalanches. People who happened to be on frozen lakes—with feet-thick ice—saw the ice shatter into pieces in front of them. There were lots of incredible sights that people had never seen before and never saw again. I understand you’ve heard an audio recording that was made by someone in Alaska during the quake. What does one hear on the recording? The most impressive thing about that recording is the sound. I listened to it while I was in college, and I didn’t know anything about the Alaska earthquake [at the time], but I remember thinking: Wow, it sounds like a freight train. It was that loud—that sort of deep, roaring rumbling noise of a close-by train. I think he was in a radio station in Anchorage and he was either on-air or recording something and he just kept the tape rolling and managed to maintain his composure. But you could tell it was frightening; it was frightening just listening to it. Why isn’t the 1964 Alaska earthquake better remembered? It’s largely because it occurred in Alaska and there weren’t that many people there. It was big news for a couple of days, but the death toll wasn’t very high. In the state it was around 113 people, which by the standards of a huge earthquake isn’t very many. After a couple of days most of the country and the world lost interest. But if you talk to people in Alaska who were alive then or know people who were alive then, they have not forgotten it. And in the scientific community it hasn’t been forgotten because it was so big and because of the work that was done—by George Plafker and others—to figure it out. 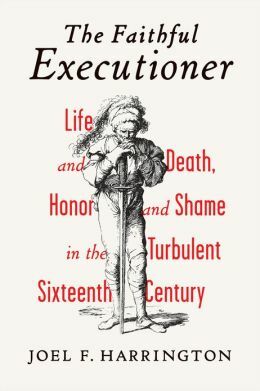 Of the people killed, how did most die? People who are afraid of earthquakes—and everyone has a right to be afraid of earthquakes—think the way they are going to get hurt or killed is by buildings falling on them or parts of buildings falling on them. That certainly happens, but in the Alaska quake ninety percent of the fatalities were caused by water—which they called tidal waves at the time and which are now known as tsunamis—which are caused by the displacement of a lot of sediment or land. In Alaska there was what you’d call a classic tsunami, which sends waves over the ocean and that killed some people on Kodiak Island and on the coast of California. But there were a lot of local tsunamis, including the one that hit the native village of Chenega, where the first wave hit the village while the ground was still shaking. Nobody had any warning or any chance to escape. Can one still see evidence of the quake in Alaska today, and if so, where? Yes, if you know where to look. In certain neighborhoods—like downtown Anchorage—you can see where they have built buttresses. A lot of Anchorage is built on a layer of clay and with all of the shaking it acted almost like grease and the soil above it slid. So in Anchorage there was a big slide that went down a hill toward a creek and it caused one side of one of the downtown streets to drop ten feet below the other. In the iconic photos you see, there is a theater marquee that is at ground level instead of ten feet above the sidewalk. Also, out by [Ted Stevens] Anchorage International Airport there is a place called Earthquake Park, which is an area where there was a lot of sliding in a residential neighborhood. The earth above the sliding claylike layer was frozen and broke apart in these giant chunks that rotated and took houses with them. They didn’t rebuild in part of that area and you can walk through this park where the land is still totally tortured. You can still see signs of landslides in certain places, too. Valdez was badly hit and had to be abandoned. You can see where they had to build the new town four miles away. If you go to the old town site you can see how it sunk during the quake and at high tide it gets flooded. One of the key protagonists in your book is George Plafker. What role does he play in the story? Plafker is still around, although he is now retired. He was a U.S. Geological Survey (USGS) geologist who worked for the Alaska branch, so in the summertime he spent his days in the backcountry of Alaska, surveying the countryside to try to figure out what kind of mineral resources Alaska had. Then he would go back to branch headquarters in Menlo Park, California, and do mapping. So he knew how to get around Alaska and wasn’t afraid of being in the backcountry by himself. When the quake happened the USGS—who had no seismologists on staff—sent him and a couple other field geologists up there to do the work. Plafker really took to it. He spent a couple weeks investigating all the different changes to the land and then he went back that summer with the idea of measuring all the changes—all the uplift and subsidence—that occurred during the quake. He did that primarily around Prince William Sound by measuring the elevation changes of barnacles on rocks. Barnacles like to settle at a certain point in relation to the high tide, so if the land rises or settles down you can get a pretty solid idea of how much the land moved. He was a very intuitive guy with no seismology training, but he was able to pretty much figure out the mechanism of this quake—which we now call a megathrust earthquake—which no one really recognized before. A lot of megathrust earthquakes occur where one of the tectonic plates is sliding (or subducting) beneath another one. In the case of Alaska it’s the Pacific Plate that is sliding beneath the North American one. Plafker figured out, pretty much on his own, that this earthquake had to be an example of something occurring at that zone where one plate is sliding under the other. It was pretty revolutionary and basically helped confirm the theory of plate tectonics, which in the mid-1960s was still a big debate among scientists as to whether it was valid or not. What is the outlook for another big quake occurring in Alaska in the coming years or decades? Alaska has a lot of earthquakes; it’s a seismically active zone. Plafker has actually done a lot of work to try to figure out how often these big earthquakes occur in Alaska. They don’t occur that frequently—every 400 to 600 years. So in terms of a big megathrust quake—which would kill a lot more people today because there are many more people living there—Alaskans are generally safe. But all that subduction and movement of the two crusts creates all kinds of other faults and they still definitely get strong [magnitude 8] quakes there. So there are bound to be more earthquakes in the near future and some of them will be destructive. People who live in Alaska realize this and know they need to be prepared. What Happened to Joseph White?—The story of the last American soldier to defect to North Korea. 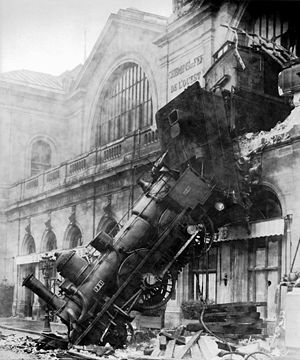 Let’s Pause For a Station Break—The story behind the world’s most famous train wreck photo.